Far more useful than you can imagine - well worth the cost. Valve-driven tones sound great. True bypass. Noise-free operation. In this clean and precise digital world, bass players are reminded constantly of just how clinical the sound of their instrument has become, particularly when being forced into using a DI into a PA or studios desks. "Background noise-free and with true bypass, this is quite simply a great performance-enhancing tool"
But, as its name suggests, this EBS unit offers a valve-driven preamp along with an XLR balanced output, plus padding and ground lift switches as required by any good DI box. With input volume, master gain and a three-band EQ with a choice of vintage or normal bias, this is ideal for adding some tonal boost, colour and drive to your sound at the kick of a switch. 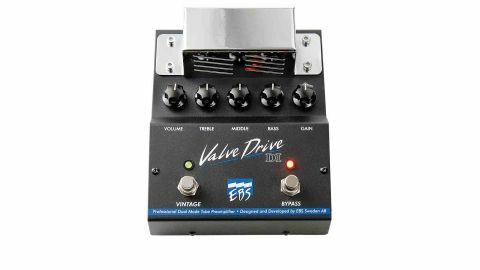 It's all about a single preamp valve (ECC83/12AX7) adding fully controllable tonal colour and distortion to your bass sound, whether you use it as a DI box or as an effects pedal. Ultra-smooth in operation, it fattens your bass tone from cool and sophisticated, or if pushed harder it's Cream-era Jack Bruce. The user manual's classic rock, vintage overdrive and crunch setting examples neatly describe what sounds can be achieved. Background noise-free and with true bypass, this is quite simply a great performance-enhancing tool that all bass players will surely appreciate. While there's nothing wrong with a good clean bass tone, there are times when it can lack body, and that's when a little dirt can add some excitement. With the usual robust EBS build quality, this is a great pedal to own.